Risotto cooked in a classic way can be tricky to make in aged care kitchens. This oven-cooked version is easy to prepare. 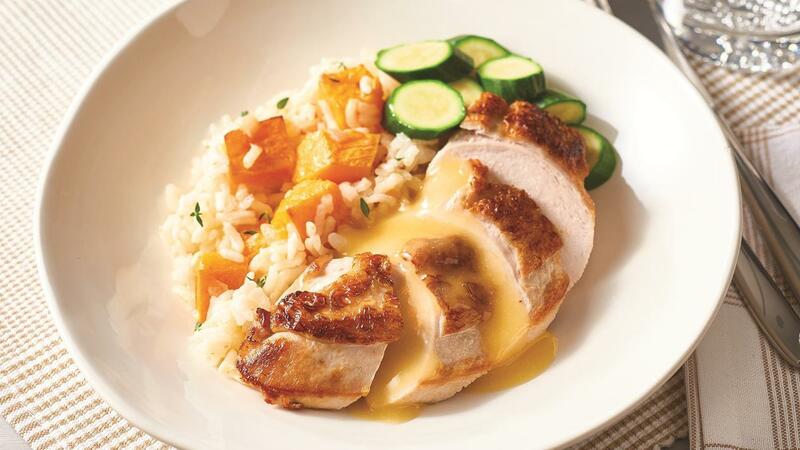 Serve with tender chicken and tangy lemon butter sauce for a complete meal. Combine the rice, onions, pumpkin, olive oil, water and KNORR Concentrated Liquid Stock in a large baking tray. Cover, place in the oven and cook for approx. 30 minutes at 160C. Once ready, remove from the oven and stir in the parmesan, chopped thyme and butter. Heat KNORR Chinese Lemon Sauce GF and lemon juice together in a pot and stir in the butter until combined with the sauce. Drizzle oil on the chicken breast and roast in the oven for 35 minutes at 160C. Once cooked, pour the prepared Lemon Butter Sauce over the top. Serve with steamed zucchini and a fresh bread roll. Tip – Another popular vegetable for risotto is asparagus. It only takes 5 minutes to cook, so add towards the end of the cooking process.